Tax Tips for Writers Who Hate Math by Helen Sedwick explains what writers need to know about declaring income made from writing and the writing related expenses the IRS will accept as deductions. Trademark: Let’s Meet Copyright’s Half Sister by Helen Sedwick explains the similarities and differences between copyright and trademark, and what writers need to know to avoid trademark infringement. How Romeo and Juliet Can Help You Write Your Next Book by Helen Sedwick explains how copyright works when writers base their stories on public domain works. Should You Be Using a Pen Name? by Helen Sedwick explains why authors use pen names, how to choose and register a pen name, and what not to do when using one. 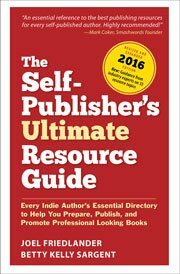 Blogs for Self-Publishers, September 13 – 19, 2014 including Sandra Beckwith, Helen Sedwick, Scott Lorenz, Barb Drozdowich and Ben Galley. 21 Tips for Creating a Successful Writing Collaboration by Helen Sedwick details what partners should know, discuss and decide when entering into a writing collaboration.